You are here: Home � All Deals , Featured , Home: Kitchen Grocery Furnishings � On Sale: Stainless Steel Ducane Meridian [A Webber Grill company] 5-Burner Natural Gas Grill normally $1,999 now for $1,189. On Sale: Stainless Steel Ducane Meridian [A Webber Grill company] 5-Burner Natural Gas Grill normally $1,999 now for $1,189. 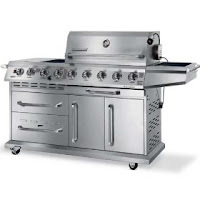 Amazon.com is selling a Stainless Steel Ducane Meridian 5-Burner Natural Gas Grill normally $1,999 now for $1,189. The Ducane 32-Inch 5-Burner Natural Gas Grill is a high end grill. It is outfitted with 304-grade brushed stainless steel. The features include: dual side burners rated at 12,000 BTUs per hour, a heated drawer to warm your foods, a storage drawer, infrared rotisserie burner rated at 10,000 BTUs per hour, a rotisserie attachment and the unit has granite inserted throughout surface. The grill also has five stainless steel main burners that have a 60,000 BTU/hour output. The grill's main cooking area measures 620 square inches, with an additional 212 square inch warming rack, for a total cooking area of 832 square inches. The grill can be wheeled into place, or you can lock the wheels to make it stationary. The grill also comes with a fitted all weather cover.